IN 2014, when a Glasgow bar dedicated to gin – specifically, 71 gins – opened on the city’s Renfield Street, it perhaps appeared an ambitious concept. Fast forward five years, however, and it seems Paul Reynolds’ idea for Gin71, which took its name from the venue’s address on Renfield Street, was on the money, with the spirit’s meteoric rise continuing apace, and the concept expanding to two further Glasgow outlets in Merchant City and House of Fraser. But with the category’s rapid growth – and subsequent ever-increasing range of gins on the market – has Gin71 remained true to its name? 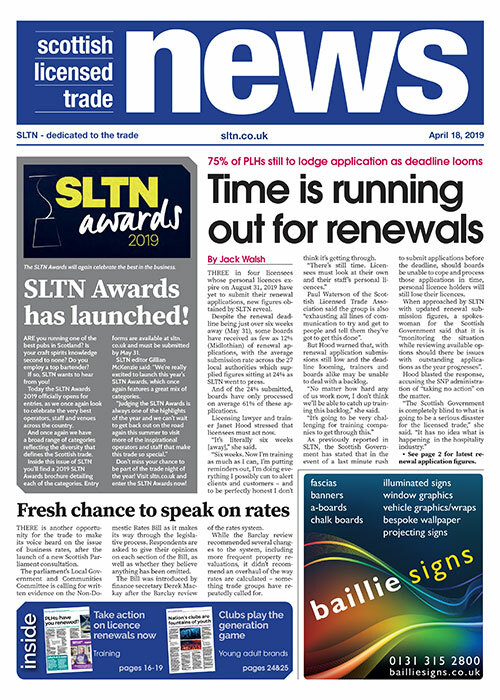 “It depends how you view it,” said David Craig, general manager of Gin71 Merchant City, which was named SLTN Gin Bar of the Year, in association with Schweppes, at the 2018 SLTN Awards last November. “We do have 71 on our gin list. “But then we also run a monthly cocktail special, called Gin Genius. So, although we have 71 on the list, we probably have about 140 in the building.” A lot of thought goes into the bar’s gin menu, which is updated every six months. With Scottish gins, people want to know where you’re getting your water from, the same as whisky. Working with a raft of independent distilleries as well as suppliers such as Huffmans, Inverarity Morton and Matthew Clark, Gin71 strives to continually offer customers unique gins and serves. “We try and have stuff that you can’t get anywhere else,” said David. “Working with a lot of the gin [firms] which are direct only may be a bit more difficult on our end, but it does mean a lot of exclusivity. It therefore comes as no surprise that David is passionate about customer service and product knowledge. Gin71 Merchant City offers table service across the 66-cover bar/restaurant (there’s also a 40-capacity outdoor space) so it’s vital that staff can talk at length about the venue’s sizeable gin range. In terms of trends, traceability and sustainability are coming to the fore, reckons David, who draws parallels between gin and Scotland’s other renowned spirit. “Scottish gins, people now want to know where you’re getting your water from – the same as whisky,” he said. The tonic/mixer that goes into the drink is also of growing importance, with Gin71 Merchant City’s selection having substantially expanded in recent years. “We started our mixers range with Fever-Tree, that was it,” said David. “They were our house tonics, they still are now, but it was pretty much only Fever-Tree we had. Keeping a close eye on developments within the industry is crucial, according to David. 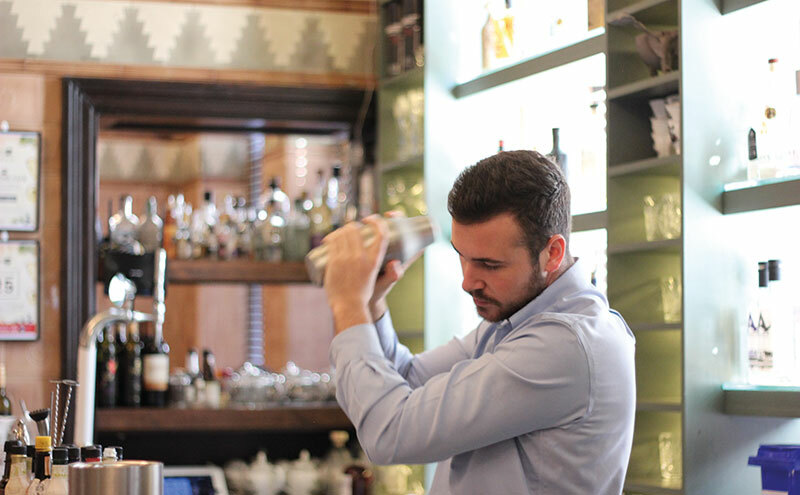 As a bar that’s underpinned by a spirit in flux, Gin71 is nothing if not adaptable. As well as gin-inspired food menus, which are paired with gin or wine, and tasting events, which utilise the bar’s downstairs events space and can accommodate up to 50 people, the venue also plays host to brand takeover events for the trade and public. Such events offer in-depth insight into specific brands; past takeovers include Sipsmiths, Edinburgh Gin, Eden Mill and Arbikie. The team is resourceful too. 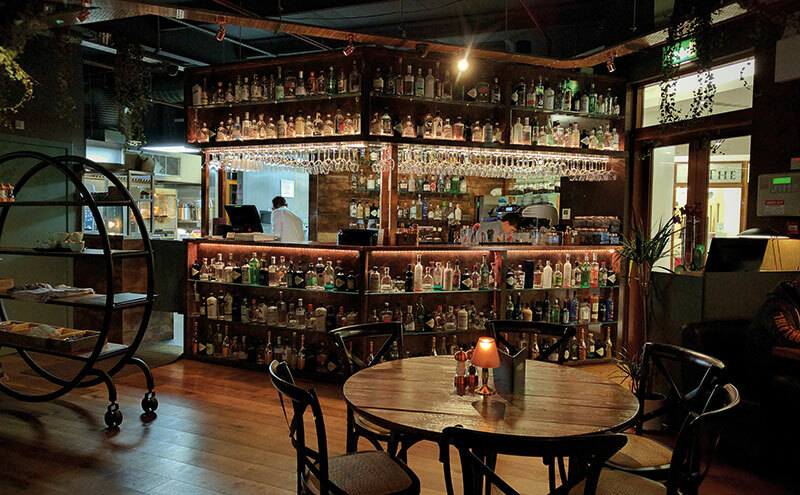 Utilising the empty bottles from tasting events, as well as the bar itself, the venue runs lamp making classes, where the gin bottles form the bases of the lamps. “One of our members of staff had taken a bottle home and put fairy lights in it and it looked really pretty and it was the centrepiece on their fireplace,” said David. “And from that we got the idea: we could actually make lamps out of these.” The classes, which typically sell out, are said to add as much as £2500 to Sunday trading and help to cut down on waste. Further innovation can be found across from the bar in its sister unit, The Gin Spa. Incorporating gin tastings with gin-inspired spa treatments, the concept has been a runaway success since it opened a year ago. So much so that the spa, which currently has three treatment rooms, is set to expand into a neighbouring unit this spring, taking it to 12 treatment rooms. “It’s a really unique concept,” said David, who reckons adaptability will remain the name of the game for the foreseeable.